SLAM PH Movie Week: Could Calvin Cambridge have won the Rookie of the Year? Young ballers all over the world dream of being able to play in the NBA. In 2002, someone was able to fulfill their playground dreams and make it to the NBA. As a kid. With the help of a pair of magic sneakers, supposedly worn by a famous, tall, bald “MJ” as a kid, Calvin Cambridge went from the orphanage courts straight to the NBA. That’s kind of like that season where Kobe Bryant wore Jordans and he upped his scoring average from 25 to 30 points, only better. Cambridge was signed by the fictional LA Knights (poor Clippers) in 2002, initially as a promotional move. The NBA hadn’t banned players straight out of high school (or, in this case, elementary) back then so this was allowed. After a stunning debut, Cambridge was signed for the rest of the season and quickly became one of the best players on the team. The young star helped the Knights get to the Playoffs that season but had to retire before that start of the season. He was ready to be a regular kid again. Just as mysteriously as he arrived, Cambridge left the game. During his short stint that season, there are still many questions that left unanswered. The biggest of which is, could Calvin Cambridge have won the Rookie of the Year? I’m here to answer that 16-year-old question. In my opinion, in order for a rookie to separate themselves from the pack, they have to be able to win games, put up solid numbers, play with style and make an impact on the league. Let’s see if Cambridge ticks off all those boxes. The timeline of Like Mike is a bit fuzzy. So I’ll have to recreate their record before and after the arrival of Cambridge based on what we watched in the movie and some real life facts from the 2001-2002 NBA season. Stay with me here. 1. The LA Knights were based on the LA Clippers so I’ll be using their record during that season. The funny thing is the Clippers finished 9th in the 2001-2002 season. They missed the Playoffs by five games. 2. The eighth seed in the Western Conference that season were the Utah Jazz. They finished with a 44-38 record. 3. The Knights needed a last-gasp win over the Toronto Raptors to make the Playoffs. That means the Jazz owned the tie-breaker over the Knights, so LA couldn’t have tied the 44 wins of Utah. That pegs their win total in the movie at 45. 4. Cambridge’s first game was against the San Antonio Spurs. Since he also won the Dunk Contest, his first game came before the All-Star Break. 5. Checking the Clippers game log from that season, their last game against the Spurs before the All-Star Break happened on January 31, 2002, the 47th game of the season. The record of the Clippers for the first 46 games of that season was 23-23. Given all of these assumptions, Cambridge played 36 games with the LA Knights in the 2001-2002 season. If the Knights ended the season with 45 wins, that means their record with Cambridge was 22-14. There was only one recorded loss in the movie and that was a 94-104 loss to the Bulls late in the season. It’s ridiculous to think that Cambridge went 35-1 so the 22 wins seems realistic. That means, Cambridge won 61% of the games he played in. It’s not that big a jump from the .500 record of the Knights before Cambridge. But it’s significant enough to take notice. It’s difficult to find a similar situation in the NBA. A comparable situation would be Ben Simmons’ effect with the Philadelphia 76ers. The Sixers finished the 2016-2017 season with a 28-54 record. They had a 24-game turnaround in the 2017-2018 season and finished third in the East. If Simmons, technically a second-year player in the NBA could win the Rookie of the Year, then voters could definitely overlook the lack of games played by Cambridge to consider him for the same award. So, it’s best to find a comparable scenario for Cambridge and the LA Knights. The closest example I can think of are the 2008-2009 Chicago Bulls. The Bulls that season were a borderline Playoff team in the East. Their best players also had a similar make-up to the 2001-2002 LA Knights. The Knights’ best player was Tracy Reynolds. The actor that plays him, Morris Chestnut stands at six-feet. Given his height and how he plays in the movie, Reynolds is a combo guard. He’s a small-ish scorer who can slash, hit the outside jumper and mostly plays in the midrange. He plays similar to Kemba Walker, OJ Mayo, or in this case, Ben Gordon. In the 2008-2009 season, Gordon averaged 20.5 points, 3.5 rebounds and 3.4 assists on 45% shooting. That’s a realistic stat line to peg for Reynolds. The Rookie of the Year that season was Derrick Rose. The young and explosive point guard teamed up with the veteran scorer Gordon to help the Bulls make the Playoffs. His impact on the Bulls, as well as the solid numbers he put up were the reasons why he was the runaway best rookie of that year. Rose averaged 16.8 points, 3.9 rebounds, 6.3 assists and 0.8 steals in his first season in the league. Given that it was realistic for Cambridge to score 27 points in less than 24 minutes of playing time, it’s also within the realm of possibility that he matches Rose’s numbers from 2008-2009. Watching the movie again, Cambridge is more of a scorer and less of a playmaker than Rose. But how they played was similar (except Cambridge had a better jumper). In the iso-heavy NBA of the early 2000s, points were a premium so Cambridge averaging around 23 points with four assists and a couple of steals would definitely be enough to consider him a candidate for Rookie of the Year. I firmly believe that Allen Iverson locked up the Rookie of the Year award in 1998 when he crossed up Michael Jordan. Iverson’s play ground style and take-no-prisoners attitude resonated with the fans of the league back then. He was gave the league a fresh look with his street ball style. That crossover on Jordan was the ultimate highlight of Iverson’s debut season. I guarantee you that when the media sat down to place their Rookie of the Year votes, that moment between Iverson and Jordan was playing on loop in their heads. Style matters. 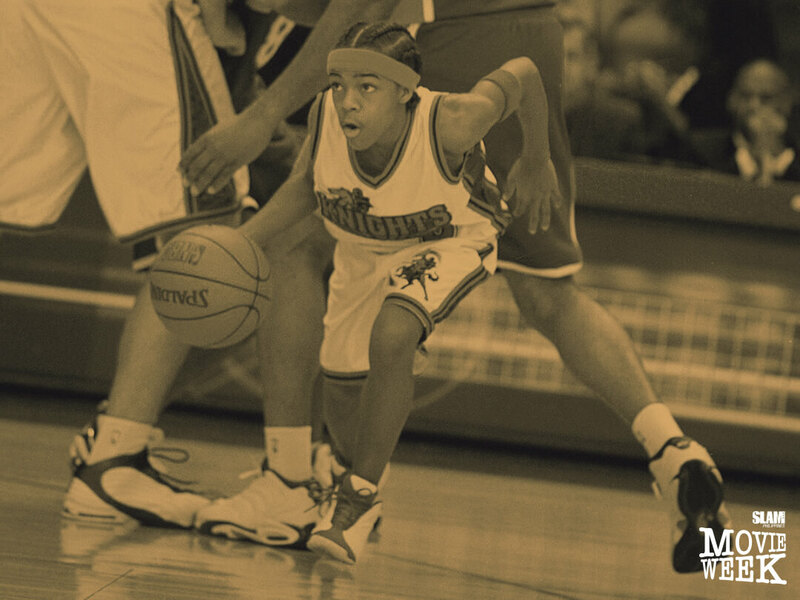 Which is why I present to you this highlight by Calvin Cambridge on his idol, Allen Iverson. More than the dunks and the game-winners and the slick passes, this Shammgod by Cambridge on Iverson was playing in the heads of voters when they sat down to make their Rookie of the Year choices back in 2002. In his his very first game, Cambridge led his team on a comeback and sank the game-winning three-pointer. It only got better from that point on. He was scoring like the Answer, dunking on dudes like Stevie Franchise and winning games like MJ. Players took notice of Cambridge. The early 2000s was filled with elite point guards. And these guys were threatened by the new kid on the block. Iverson shrugged him off. Jason Kidd and Gary Payton were out to shut him down. Vince Carter was out to intimidate him. Dirk Nowitzki even tried to get his autograph. Cambridge came into a post-Jordan NBA and gave the league something new to talk about. He was a sports producer’s dream. Cambridge produced highlights in every game he played in. More than that, the storyline was just too good to be true. Here was a local kid from a troubled background who was living out his NBA dream. Cambridge was like LeBron James, without the pre-NBA hype. The most impressive thing about Cambridge was how he was able to shift the focus away from the LA Lakers to the movie’s version of the LA Clippers. In the early 2000s that was almost impossible to do since that was the height of the PhilJax-Shaq-Kobe three-peat. Anyone who could do that was definitely worth of a first place Rookie of the Year vote. The key players in the 2001-2002 Draft Class were Pau Gasol, Tyson Chandler, Shane Battier, Joe Johnson and Jason Richardson. A lot of the players on that Draft Class went on to be solid NBA Players, some even went on to win championships. The Rookie of the Year that season was Pau Gasol. He averaged 17 points and nine rebounds for a Memphis Grizzlies team that won 23 games. Those are all solid players. Gasol is a sure-fire member of a future Hall of Fame class. But, I’d still rather have Calvin Cambridge as my 2002 Rookie of the Year.